Congress 2015 is being hosted at the University of Ottawa. 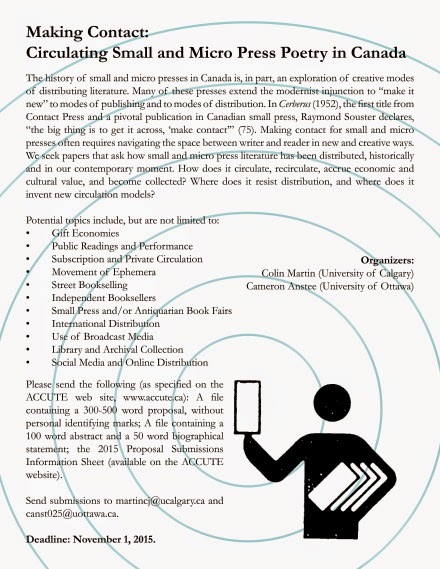 Colin Martin (University of Calgary) and Cameron Anstee (University of Ottawa) wrote a CFP for a member-organized session for ACCUTE that has been accepted. Full details below (pdf over at Anstee's original link, here), and further member-organized session CFPs available here. Send them your stuff! Our big trip, part two (see part one here). As Christine informs, over a period of eleven days we drove some 3765.47 kilometres. A drive of 41 hrs and 45 minutes. With a ten-month old. Madness. Part of our trip thrived on the level of accident, seeing what we might see as we went, and allowing ourselves the time to explore. Our schedule of travel really focused on the people we were visiting, with the remainder at sites we might never have even seen had we bothered making too many plans. Tuesday, September 16, 2014: Leaving Saint John (after a morning of wandering), we landed in Moncton, New Brunswick to spend some time with an old school friend of Christine's. Rose was initially less taken with Jeanette's toddler Beatrice than with Beatrice's toys [above], but that was eventually settled. They circled each other, curiously. After lunch, we had just enough time to make it to Hillsborough, to catch the Hon. William Henry Steeves House and Museum before it closed at 5pm. Hon. Steeves (1814 - 1873) was one of the Fathers of Confederation, a couple of generations after the Stieffs family arrived and changed their name to Steeves (an array of Pennsylvania Dutch families arrived to thrive in the area after the expulsion of the Acadians, a number of whom Englicized their names). This makes everyone related to a Steeves a descendant of this family, including Christine, as well as Gaspereau Press editor/publisher Andrew Steeves. The list of other notable descendants is impressive, and includes Jack Layton, as well as some thousands of others. We were quite a while in the house, as Christine sat in the back adding our information to theirs at Ancestry.ca. Given the amount of family they're attempting to track, its quite a daunting project, but Christine's (and thusly, Rose's) lineage is now included. As Christine was involved in such, Rose and I were given a tour of the family church [pictured, above], which is still in use. An oddly-shaped building, it is really quite lovely. The inside is designed as a ship, and to look up to the ceiling is to see the upside-down outline of a sea-worthy hull. We were there far longer than we had hoped, and were very taken with the generosity of the couple running the place. Upon leaving, we made for a small bed-and-breakfast in the Village of Parrsboro, and took a walk to see the water, and other sights, before retiring. Wednesday, September 17, 2014: I was slightly annoyed that the b+b (as much as we enjoyed such) didn't include a highchair or booster seat in their little breakfast nook (Rose, attempting to eat Cheerios from the breakfast table), Christine suggested that most other parents might travel with such, and Rose didn't much mind. Apparently the building was once a hospital, and our room had once been the delivery room. Delivery Room, meet Baby. Our morning included the Bay of Fundy, wandering the beach right by The Ottawa House By-the-Sea Museum, known as the summer home of Sir Charles Tupper (another distant relative of Christine's). We wandered the beach for a bit, and Rose picked an array of stones, and wore the onesie-with-kilt (Nova Scotia tartan) that Christine picked up for her at the Glengarry Highland Games. Christine walked far further than we did, with Cape Blomidon in the distance (can you see her in the far, far distance, above?). Rose and I kept close, as we do. Apparently the shore is known for amethyst, but we found nothing of the sort. Apparently one has to break rocks to discover them inside (we weren't travelling with any such devices to break things apart). The Ottawa House was impressive, but the tour far less than the Steeves House (which made me appreciate even further our experience there). This was another building on summer hours, despite September. It allowed us all to pretend that summer wasn't actually over. Oh no. In the photo above, Christine and Rose in Sir Charles Tupper's front room, surrounded by photos. Later, driving and driving and driving (including some places the gps took us we hadn't exactly planned on), we accidentally came upon the house that Elizabeth Bishop lived in as a child, with her grandparents. Apparently it had been a writers retreat for some time, but is currently for sale. How is this house not a museum? How can a building like this be for sale at all? When we couldn't figure out where it was (oh, Christine said, the Elizabeth Bishop House is in this town we're passing through! ), we stopped at a gas station. Where is it, I asked? The man at the counter pointed across the street. How random is that? Someone out there has to purchase this house. Why is it not a museum? By the afternoon, we'd managed our way to Gaspereau Press, where Christine had worked for a couple of years roughly a dozen years back. After some twenty years of irregular correspondence over email (begun when Steeves was still a student at Carleton University) I was finally able to meet the illustrious Andrew Steeves, and we spent some good time with him as well as Gary Dunfield (who I'd met at a Griffin Awards Gala or two). The space is absolutely amazing, and worth a visit. We got a tour of the building (moved since Christine worked there), and Rose crawled around the floor, turning the palms of her hands black. We even saw a new memoir by John Terpstra as it was being built. After twenty years, it was good to finally meet Andrew (and we were in agreement on a great many things--far more than I might have suspected), and he was kind enough to give me a selection of some of the chapbooks they'd been producing over the years (they were good enough to do one of mine, even, as part of the series), and I left with a small stack of works by Triny Finlay, ian letourneau, Brian Bartlett, Wanda Campbell (a book Christine typeset while at the press), Lisa Martin-DeMoor, Alison Smith, Peter Sanger and Tonja Gunvaldsen Klaasen (a poet I really hope has something new out, soonish). There are other chapbooks in the series, but I already have at least a couple of them. Over the years, I've reviewed some of them here and here and here (for example). And of course, Rose managed to crawl around on the floor and slip, landing her head on the side of one of the big machines before hitting the floor, far more startled (and tired) than anything else. A stain of black ink all across her white onesie and the side of her face. Given that Christine had lived here for a while, during her studies at Acadia University and subsequent Gaspereau Press staff, the trip felt like a kind of homecoming. She pointed out buildings that used to be other buildings (including the liquor store that formerly housed the furniture store where she'd purchased the bed that now lives in our spare room), and where she'd done this, and that, and that other thing. I was being introduced to her historical spaces. And then there was the building named after her half-uncle's mother's family. Apparently her grandfather's first wife had come from quite a wealthy family. Who knew? Thursday, September 18, 2014: We spent two nights with former Gaspereau Press publicist Beth Crosby, and she and her husband were both entirely lovely and generous, and were thrilled to be able to spend time with the baby (photo of Rose and Beth playing with lego, below). It's always nice on a trip to be able to mix hotel and friend's homes, but it makes for a slightly trickier thing to visit someone's house with a baby (one never wants to be in the way, etcetera). And in the morning: another brief coffee with Mr. Andrew Steeves, sitting in a coffeeshop where Rose did her best to say hello to everyone, charming strangers and Steeves alike. While in Wolfville, Christine did a small talk for a creative writing class, invited to speak by her former thesis adviser, Wanda Campbell. She was generous enough to take us all to lunch first, which was quite lovely. Rose and I wandered the town during the span of the class, and baby slept in the carrier. And we were able to see Cape Blomidon, sitting in the Bay of Fundy, from the opposite side [above]. We wandered, and even managed to say hello to some of the other faculty in the department, including poet Lance La Rocque and Herb Wyile (who I met at the Postmodern Conference a few years ago at the University of Ottawa, and published a very cool book of interviews). Upon leaving Acadia, we wandered over to the house Wanda and her husband were renovating, with a magnificent view of the valley below. Oh, what a view. Why, exactly, did I not take any pictures of that magnificent view? After Wanda's house, we managed not one but two wineries: Gaspereau Vineyards and Grand Pre, both of which were thrilled to help keep baby Rose entertained (which impressed us). She wandered the floors (supervised, obviously, by us), and the second winery even managed to pull out a box of toys for her to play with (really?). In-between: we visited a wool store, housed in a converted barn on a little farm, with chickens, sheep and other animals. Rose was angered at the fact that the chickens wouldn't say hello to her, despite her numerous attempts. She was indifferent (and even baffled) by the sheep. But perhaps, after her disappointment with the chickens, she had nothing left to offer the (also indifferent) sheep. They were sheep, after all. Wanda Praamsma grew up in Clayton, Ontario, near Ottawa. Her first book, a thin line between, appears this fall through BookThug. 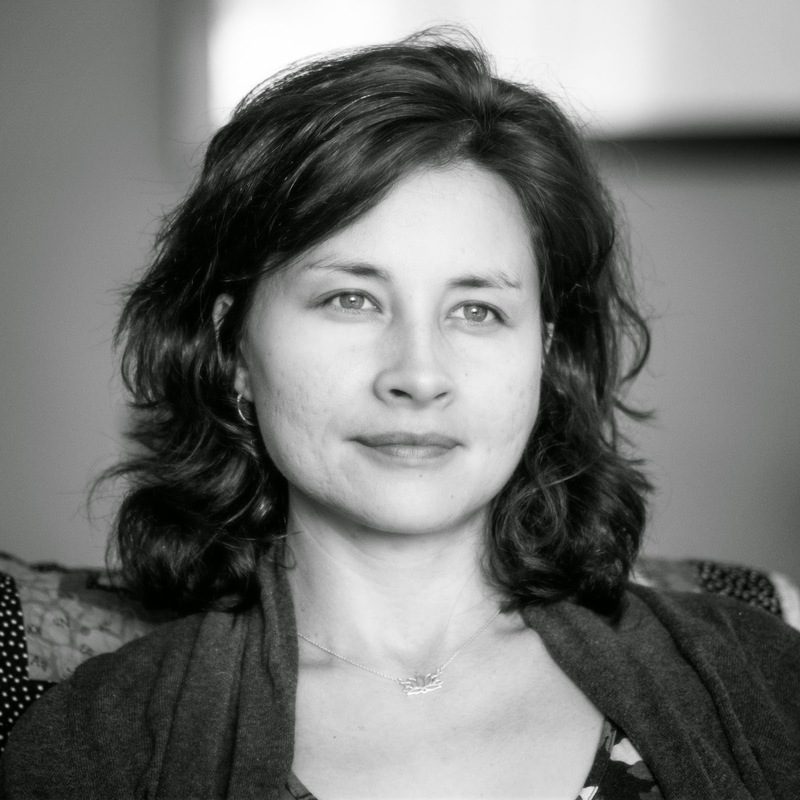 Her poems have been published in ottawater, seventeen seconds, and Feathertale, and several literary non-fiction pieces have appeared in the Toronto Star, where she worked for several years as an editor. Praamsma currently lives in Kingston, Ontario. Publication-wise, I’m not sure yet, but writing and finishing a thin line between was a big leap for me, out of journalism and into poetry. It solidified something I knew about myself – that I’m a poet – but didn’t enact fully until taking the time to really explore myself on the page. I came to non-fiction first, as a journalist – but there were always poems there, too. I always saw, and still see, headline-writing as a form of poetry. It seems to come fairly quickly, and then I do a lot of whittling-down. Some poems come out very close to final shape, but for my long poem, I whittled and whittled quite a lot of the prose-y parts. I am very much a jotter-downer of things, and then I begin to piece things together. The long poem seems to be a form I enjoy. Everything seems to begin short, in short pieces, and then combines into a whole. I haven’t done many readings yet but I do imagine they will form part of the process in some way. I’ve always loved reading aloud. It’s also a chance to voice how I heard it all in my head while writing. I have a hard time even wrapping my head around the phrase “theoretical concerns.” I’m sure they’re there, but others can figure out what they are. Certainly there are a lot of questions. The big one: who am I? and also, who are you? For a thin line between – I wanted to explore my family, on both sides of the ocean, and how I fit within that family. Art and love and death emerged from that. I see the writer’s role as the same as any artist: to uncover, unravel, reveal and expose. Within both the personal and beyond-personal (social) realms. At a crucial moment in writing my book, and not knowing if it was finished or not, a poet-friend said to me, something like, “Our writing changes. We change.” Right then, I knew it was done – or very close to being done. It was time to move on. I am just starting to get into critical prose so I’m not sure yet how easy or difficult it is. I have a little baby now so there is no routine. I write and read while nursing, and when baby sleeps. I used to get up, do yoga, write for a bit, read for a bit, then repeat. On days I worked elsewhere, I’d still get up and do yoga and write, but then also try to write on lunch breaks and on the ferry to and from Wolfe Island, where I used to live (now I’m on the mainland, in Kingston). When my writing’s stalled, it’s generally because I have too much else going on. It means it’s time to pare down, clear the mind. Then the words come again. I need space to catch thoughts. Doing yoga, meditating, long walks – they all give me that. But also, visiting art galleries, travelling, and reading – not just poetry, but prose and books on yoga and eastern philosophy. so there’s that – and nutmeg, too. Visual art, especially. I like my words to spring from sculpture, pottery, painting, fibre art. I find great freedom in examining/observing/peering into other people’s work. I like to find an abstract puddle to dance in. For my work, particularly this first book, the Dutch Fiftiers (Vijftigers), a group of experimental writers and artists that emerged in the Netherlands and Belgium after World War II. My grandfather, Bert Schierbeek, was a member. At the time of writing this long poem, I was reading lots of the Fiftiers – not much poetry by any others – but also lots of novels, especially Haruki Murakami and Arundhati Roy. Also important and much loved are Daphne Marlatt, Sheila Heti, Phil Hall, Alan Watts, Garcia Marquez, Neruda. Visit Shikoku in Japan, and be a pilgrim to the 88 Buddhist temples on the island. I’ve always been intrigued by the workings of cities, especially transit/transportation – how people move through cities and act in those buses, streetcars, subways ... so maybe a city planner of sorts ... but I don’t really believe there’s much choice when it comes to what you do – if you’re in tune with yourself, you land deep in what you should be doing – and writing is what I should be doing. See above, but also, when I was little, I went through a series of what-I-want-to-be-when-I-grow-ups, all based on TV shows(!). I wanted to be a marine biologist because I loved whales and we used to watch Danger Bay. Then we watched Street Legal and I wanted to be a lawyer. Then it was Superman, and I decided on journalist. Somehow journalist stuck, because I then went to journalism school. But, seriously, it was when I started writing for the local paper in high school that I decided I wanted to write. Then, once I was in the journalism world, I realized I wanted something more through my writing – that’s when I started writing poetry. I just read Dionne Brand’s No Language is Neutral and loved it. Read 1Q84 and Kafka on the Shore by Murakami earlier this year, and both are very good. I am not so much a film enthusiast/connoisseur, but I was just given a dvd copy of Out of Africa – still my favourite. Another long poem. And there’s a novel simmering on the far burner. was your Rose, your Lily, your Loralie dying over & over with the slow pause of an early silver screen, grass gone nickel, skin gone glycerin. & in the corner the shotgun & the emptied urn, rusted urn, the lifting stone where pillbugs curl & hide as heavy in wet wool you leave the scene through the garden door. Under the rubric of excuse is the story in which I was last in a lineage of hunters, the once-seasonal rain that wouldn’t go. When, in 2006, I moved to Central Pennsylvania, I never had lived so far east, nor had I—a native of Southern California—ever lived in such a rural area. What struck me first was the enormous beauty of the landscape: all trees and river, I felt I was living inside an emerald. Then I began to learn the environmental trauma the landscape had suffered, and still suffers, from the legacies and traditions of mining, lumbering, and now fracking. Also: there are contradictions in such places where the wide, slow Susquehanna runs idyllically along small farms—but between river and farm container trucks zoom past both Amish horse and buggies and adult bookstores. At one point near Harrisburg the road crests through rounded green hills to a view of Three Mile Island. The first book, AFTERMATH, seeps in this landscape, foregrounding the embodied experience of beauty and rend. There is catastrophe under-tremmoring the book, but it remained unnamed. After writing AFTERMATH I thought: what if the catastrophe were to be named? What, then, would happen to the language that I have on the page? How would it curve to an “aboutness?” The Grimm brothers’ tale, “The Juniper Tree”—wherein a stepmother kills her step-son and allows her daughter to take the blame—intrigued me because of its savageness, because of its questions of guilt and responsibility. Also, the boy’s bones, buried under the same juniper tree that shades his birth-mother’s grave, transform into a bird that avenges his death—an intriguing metamorphosis of innocence into the agency of the natural. I re-worked AFTERMATH around this tale with the intention of revision, but in the end I found that I had written a second book, Become Tree, Become Bird. A handful of friends were kind enough to read the two different books and to offer their opinion on which book was stronger. G.C. Waldrep, who shares this Central Pennsylvania landscape, suggested that I put them together. Instantly I loved this idea, for it would foreground what happens when narrative is introduced to landscape and embodied experience. The project became A Conjoined Book. to have been what was lost. If you were following our updates via Facebook, you'll know that we recently returned from an eleven day driving tour, from Quebec to the Maritimes into New England, driving out to see various folk that we never get to see, before Christine's maternity leave ends in November. What madness! We aimed for no more than four or so hours of daily driving (which didn't always work), and Rose managed to survive the process far better than we might have expected. We aimed driving in the morning and afternoon to her naps, with an hour or two break for lunch, to get her fed and allow her to tear around a bit. I found a little blank notebook I'd never actually used yet (most likely, I think, a Christmas stocking bit from dear mother-in-law) for the sake of scattered notes, phrases and assorted what-nots. I took a stack of books to read (never opened), and TONS of material for give-away, handout and otherwise distribution (of course). I sent postcards to my lovely daughter Kate from every stop. Rose charmed everyone. Waving and smiling even at those who weren't paying attention. Saturday, September 13, 2014: We drove out to Pointe-Claire, Quebec, a suburb of Montreal where Stephanie Bolster and Patrick Leroux live with their two girls. Can you believe it's been a decade since I was last in their house? That was back when Kate was but thirteen, and Patrick hadn't seen her in a decade. It has been a while since Patrick and I touched base. He's a Franco-Ontarien playwright I went to high school with, and now so rarely see, so the visit with them was really one of my highlights of the trip. Has it really been eighteen years since I produced that first chapbook of hers? Has it really been twenty years since our pal Patrick came home from the Banff Writing Studios and told us he'd met an English poet from Burnaby? The rain en route to Quebec City was absolutely fierce. It hit and struck and pounded, down. Once landing, Rose made friends before we'd even left the car (she waved at a young couple in a restaurant window, and they happily waved back). We found the most lovely little bed and breakfast, right across from the Chateau Frontenac, where we attempted to calm the baby into sleep. Via YouTube, I presented Rose with her first experience watching Bugs Bunny cartoons. Eventually, we slept. Sunday, September 14, 2014: We wandered a morning and early afternoon of Quebec City. We walked along the walls of the old city, and explored the fort and museum. Oh, what lovely views. Rose, given it was time for such, slept. There's a part of George Bowering's Stone Country: An Unauthorized History of Canada (2003) that I'm rather fond of, caught in my head as we wandered the Plains of Abraham: "Really, there is nothing biblical about the Plains of Abraham. Here was a nice grassy field that had been granted to a ship's pilot named Abraham Martin in 1645. If it had been granted to his brother, the great battle would have been fought on the Plains of Claude." The view from the Plains was absolutely breathtaking. And the weather was perfect. Just in case, Christine wore the rain-jacket she'd picked up at the train station in London, en route to Paris, during our honeymoon. Christine thought I looked far too much like this statue, so (with baby + carrier) had me pose along such. A long distant relative, perhaps? And of course, tea at the Chateau Frontenac. Or at least, some tea and a cocktail or two. And postcards! The Basilica in Quebec City appeared to be in the midst of a grand celebration, celebrating an impressive three hundred and fifty years with a video screen showing a brief history, increased security, and a grand door that the faithful can enter (only the seventh door in the world, and the first outside of Europe). It looked quite impressive. And then we headed towards Edmunston, New Brunswick, knowing the drive would be baby-tolerable, before we continued further east, further. Monday, September 15, 2014: We woke in Edmunston, where Rose and I played on the swings briefly, in the first-thing sparkle of morning mist. Driving: did you know the longest covered bridge in the world is out here? We wandered over to such, but it was closed for repairs. Still, we took numerous photos of each other out front. And I had shades of recollections of perhaps being through here when I was quite small, a family trip I have yet to ask my father about: were we out here? Did we drive this way then? Memory can be the most tricky of things. Inside the bridge, where we saw workers working, welding and what-not. We could not cross (at least, by car). We were heading for Fredericton, where we had lunch with Broken Jaw Press editor/publisher and Chaudiere Books author Joe Blades, who was working part of the election. It was good to see him, and pass along some publications for him to distribute around his immediate local. It had been possibly half a decade since I'd seen him last. I will say it now: parking at the University of New Brunswick is stupid. Visiting Joe was quite nice. It had been too long. And, before he returned to work, he offered us passes to the Beaverbrook Gallery, a space I'd long heard of but never actually seen. We were fortunate: summer hours still existed, otherwise it would have been closed on Mondays. I had expected it, somehow, to be bigger. But some of the artwork inside was incredible. Rose and I, of course, had a brief photo-shoot at the Robbie Burns statue outside. We allowed Rose to burn off some energy by rolling around in the grass (she is still very uncertain of lawns and grass, somehow) before we returned her to carseat, and was reminded of how we disappoint her in so many, many ways. We kept driving. Rose fell asleep. We made the hour or two to Saint John, New Brunswick, where we visited Christine's friend Anne, who lives in the most lovely apartment downtown. Tuesday, September 16, 2014: Before leaving Saint John, we wandered a bit by the waterfront, including through a small mall and market square building. We even saw granite sculptures being carved by the waterfront, and were afforded a brief tour of such by one of the people working there. How marvellous! I'd never seen granite sculptures being constructed before. The water, the water. I think Christine had missed the ocean, tucked so long away in the Ottawa Valley. Rose cranked slightly, so we moved a bit quicker, for the sake of a possible nap. We saw a kilometre-marker, which I haven't yet looked up. Andy Weaver was born in Saint John. I sent him a postcard: Everyone here looks like you. In her 1977 publication L’Amér, Nicole Brossard wrote “écrire: je suis un femme est plein de conséquences.” Barbara Godard, a bilingual feminist critic, translated this as “to write: I am a woman is full of consequences” (These our mothers, 45). Writing, women, risk, consequences. These things are at the core of the mandate for Canadian Women in the Literary Arts. Begun as a grassroots feminist organization aimed at bringing discussions of gender, race, and sexuality into public forums, CWILA is now an incorporated organization with more than five hundred members. We have been conducting “The Count”—an annual audit of gender equity in Canada’s reviewing culture—for three years now. This our new third Count, which covers reviews published in 2013, continues to demonstrate a marked imbalance in whose books are getting reviewed, as well as in who is doing that review work. Why? The “W” at the core of CWILA is always a contested space. In other words, as Brossard wrote in 1977, to write the word “woman” is to take a risk. Look at Brossard’s sentence. While it is tempting to read it without the colon (to write I am a woman is full of consequences) the punctuation is in fact a gatekeeper. Granted, the colon keeps the gate grammatically ajar, propelling the reader forward into fact. With a simple act of punctuation Brossard has shifted the category of “woman” into a direct relation with the work of writing. Writing is full of consequences, gendered categories are full of consequences, and writing about marginalized genders is full of consequence—be it in this introduction to the 2013 numbers, in a review, or in a blog post. And yet, the gate is ajar. We started CWILA in part, as a concrete way to address concerns about whether or not Canada’s literary culture had representational justice. Representational justice—that is, the deliberate mechanisms that ensure marginalized groups are represented in a given context—is a starting point. Counting gender representation alone cannot ensure a just and robust literary culture, nor can it eradicate the micro- and macro-aggressions of sexism, racism, cis privilege, or homophobia. The numbers do one thing: they provide a place to start a public discussion. And let us not forget that public discussions that rattle the bars of the status quo are risky. The second epigraph that introduces this essay was written by Sina Queyras in her 2009 introduction to Unleashed, a selection of her blog posts composed between 2005 and 2008. 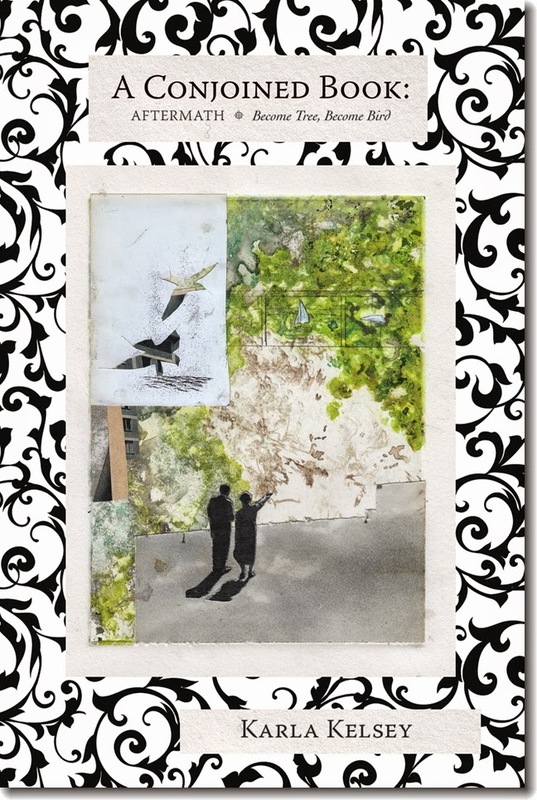 The blog quickly evolved into a public facet of her writerly practice: it was a way of exploring, experimenting, and coming to terms with the ever-increasing relevance of the Internet in a literary life. The blog, Lemon Hound, also became a tool for asking why women writers are still disproportionately under-represented in critical dialogues about their work. Here is the thing: blogging about inequity is risky. Writing about or as a woman is risky. Taking up public space to write about or as a woman is risky. The risks are multiple and they are polarized: you may be attacked or you may be ignored. Queyras’s blog is one site where these risks were taken up and reflected upon. Writing is a private act, until, that is, it is not. Blogging, as Queyras observes, makes this risk of public writing clear. The minute one hits “publish” on a post those heavy consequences are waiting at the gate. The CWILA Count is a public attempt to append hard numbers to the more general feeling that male writers and reviewers get the most representation in Canadian literary culture. This public attempt is not without its risks, but the possibility of representational justice is always worth the risk. The location of the first part of our equation—public + women—is risky in part because it is an equation that is always contentious. What do we mean when we say “public” in relation to the literary arts? Indeed, what do we mean when we say “women,” and what can we mean if we are more expansive in our understanding of the outsider status of the term? For CWILA, the book review is one key place to press the equation of public + gender, and, by extension, of equitable representation. In A Room of One’s Own, Virginia Woolf speculated about what histories and knowledges have been lost by leaving women out of literary history. That was in 1929. We have a responsibility to expand Woolf’s focus. We have a responsibility to ask whose knowledges and histories are lost, hidden, or actively marginalized when there is not representational justice in a living literary culture, let alone literary history. CWILA maintains that literary culture is one concrete place to work to consciously and ethically take into account the multiplicity of gendered identities, nationalities, and languages that comprise this country. And while CWILA does not yet have the labour power to ethically track statistics based not just on gender, but on racial and ethnic identity, sexuality, class, and ability, we are beginning to develop a set of apparatuses to track these trends. The Count is imperfect, but the trends of inequity which we track suggest that it is necessary and it is a means of asking questions about equality in public. 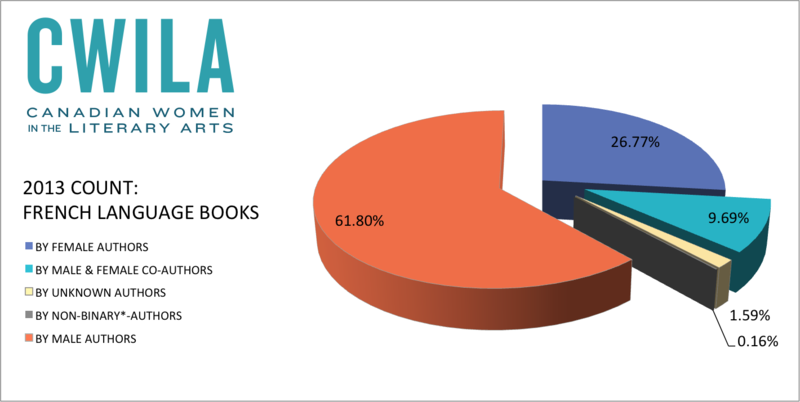 Primarily, what the new Count data shows is that despite the often-positive reception of CWILA’s Count and the organization as a whole, there is still a significant gap in terms of equitable gender representation in literary reviews. In other words, despite much strong support from editors and publishers for CWILA’s project after the numbers are released inequity remains. Moreover, there’s been backlash. Public + Women = Risky, yes. But asking pressing questions representational justice is a necessary risk to take if we are to significantly and generatively shift Canadian literary culture. A thumbnail sketch of the 2013 Number can be summed up like this: regression. 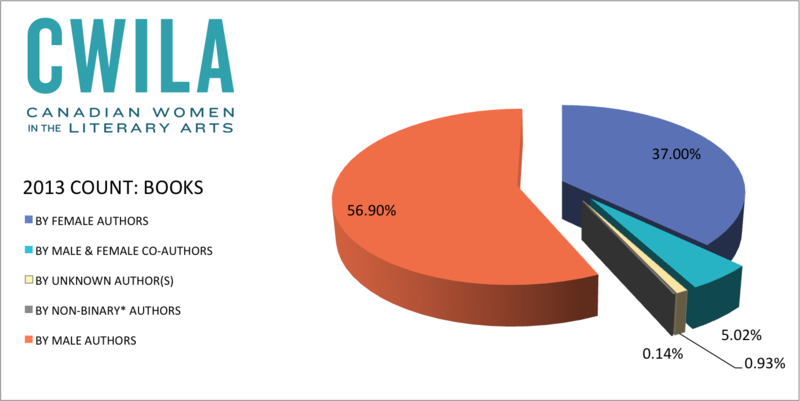 Overall, 37% of the review space counted by CWILA volunteers went to women, 57% of it went to men. While it is a truism to suggest that the numbers speak for themselves, the aim here is to sustain public discussion about representational justice in Canada’s literary culture. We need to unpack the stories that the numbers tell. As Count Director Judith Scholes outlines in her essay detailing our methodology, the Count is not comprehensive. It does not count every single book published in Canada. What the Count provides each year is an evolving data set that allows us to begin tracking trends over time. This year, with the indispensable labour of more than forty volunteers, we were able to expand the Count in significant ways. For example, in the Count of the 2012 numbers, CWILA began to nuance the language we use to adequately represent gender—from male/female binaries towards a more accurate male/female/non-binary representation of writers in the Canadian context—and we have continued to refine that language in the Count of the 2013 numbers. We were able to expand the quantity of publications we counted from 25 to 31. For the first time we have the linguistic capacity to include French language publications (Le Devoir, Lettres Québecoises, Nuit Blanche, Liberté: Arts et Politiques), and we had the volunteer capacity to add three metropolitan newspapers (The Toronto Star, The Chronicle Herald, Le Devoir). We increased the total numbers of reviews counted from 3,092 in 2012 to 5,613 in 2013. That is an 82% increase in the scope of our Count. Thanks to our volunteers’ efforts and our Count Director’s expertise we are now able to offer a broader regional representation and begin to take into consideration the culture of critical reviews in both English and French Canada. These new numbers reiterate old stories and tell some new ones too. Put simply, there’s still a gap. When is the last time you read a book review? Look closer at the byline of the review—who wrote it? Are you reading it online, or in a print publication? Now take a moment and look at the other books reviewed in that publication in the last month. Are they reviewed by the same people? Can you see any trends? Why did you read the reviews section? The answers to such questions, in broad terms, can tell us something about the ways in which we engage in the culture of literary economies; they can also contribute to larger, complicated narratives about equity and representation. This is CWILA’s third annual Count. The concerns that initiated the organization were deceptively simple: it seemed as though we—readers in Canada—were hearing more about books by men than about books by women. Was this true? Could the hunch be extended to other marginalized groups? And if so, how might one gather compelling data that supported this hunch? Three years and three rounds of data-collection later, the concerns remain while we also work to ask better, more nuanced questions of the data. In the age of the corporatization of everything, the CWILA 2012 numbers are less a good news story proving vibrant cultural nationalism and more evidence of communal resistance to a weakened literary economy. Reviewers, review editors, and publication boards make choices. They have chosen to support the arts in Canada by allotting space—however dwindling it may be—to work by Canadian writers. And yet, the conversation about the “C” in CWILA is hardly finished. Rather, the 2012 focus on national representation has inspired the CWILA team to think carefully about how to convey the complexities of national affiliation. The question of what makes an author “Canadian” is hardly new, but thinking publicly on an annual basis about it requires that we continually nuance our terms. In 2012, 65.5% of reviews counted were of books authored (in whole or part) by Canadian writers, and 33% were of books by non-Canadian authors. In 2013, 60% of reviews counted were of books authored (in whole or part) by Canadian writers, 39% were of books by non-Canadian writers. The remaining 1% accounts for books by unknown authors or collectives for which nationality could not be determined. Overall, 33% of reviews counted were of books authored by Canadian men, 24% were of books by non-Canadian men, 25% were of books by Canadian women, and only 12% were of books by non-Canadian women. Put starkly, a non-Canadian woman writer is just over a third as likely to get review space in a Canadian publication as a Canadian male writer. Our 2012 numbers revealed a similar statistic and so, the inequity that we recognized last year seems to have intensified this year. One of the questions we would do well to ask ourselves is what we can do to ethically address this tendency and to shift it. 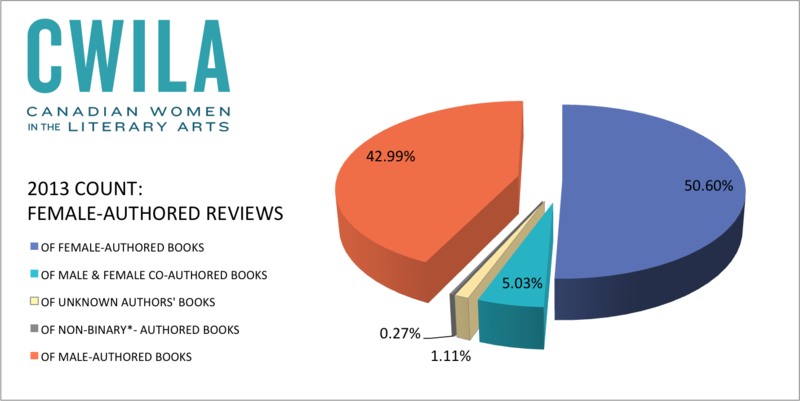 Overall, the 2013 Count shows that the majority of books being reviewed are Canadian, but that majority is smaller. Why? Only time, consistent data collection, as well as sustained and active conversation will tell. In the Count of the 2013 reviews we introduced a new focal point—language. A clear limitation of last year’s count was its sole focus on English language reviews. We were criticized, rightly, for failing to count French reviews in our “Canadian” numbers. For us, the “C” in CWILA stands in—or aims to stand in—for all gendered, racial, and socio-economic communities located in the country now called Canada. And yet in practice, as a non-profit organization run almost exclusively by volunteers, we are hampered by our own limitations. Last year we simply did not have the resources to count in both official languages. This year we made it a priority to figure out how to do so. With the labour of our dedicated volunteers and editorial teams we expanded the linguistic content of the Count. We were able for the first time to count French language publications: Le Devoir, Nuit Blanche, Lettres Québécoises, and Liberté: Art et Politique in addition to counting the French language reviews in Canadian Literature. We added these four new publications based on circulation and numbers of reviews published. This inaugural sample of French language representation in the Count is partial. It cannot give us more than a glimpse into gendered statistics in French language publications. And yet, it allows us to practice our mandate a little more fully. If we are ever to adequately account and advocate for representational justice in Canada’s literary culture then we will continually need to expand our fluency in the languages and the cultures that make up this shared space. In doing so, we have decided to publish essays in both English and French and to consider the results of the Count through first the integrated data you see here, and, next week, with a careful focus on considering the French numbers on their own. Next week’s spotlight will include an essay on the French language context written by Evelyne Ledoux-Beaugrand, with an English translation of her essay by Bronwyn Haslam. Our initial foray into counting French language publications underscores that talking about representational justice in a public forum, while risky, can effect positive change. Of the 1,259 French language reviews counted, only 27% are on books authored by women, while 62% of the French language reviews we counted are about books written by men. These are not heartening statistics. However, they are familiar. 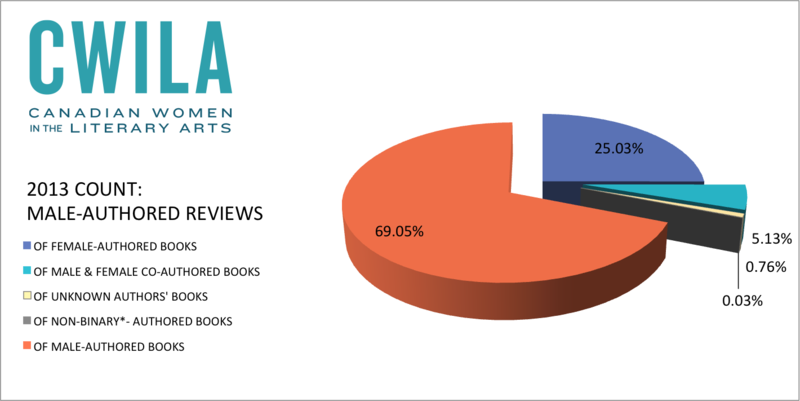 These statistics which, don’t forget, represent our first foray into a French language Count, are strikingly similar to the statistics from our initial Count in 2011 when only 41% of the reviews we counted were about books written by women. In fact, the numbers we have collected from French language reviews are not so terribly different from the 2013 English numbers. One very interesting percentage emerging from the French data, however, is this: 10% of the review space we counted is dedicated to male and female co-authored publications. Does this suggest that collaborative creative and critical work is being rewarded with review space in Quebec? Perhaps, but only a broader, more sustained Count will provide the data we need to say for certain. What is clear is this: in both French and English Canada, discrepancy and inequity are still the order of the day. Of the total reviews counted (5,613) there were 1100 more reviews of books written by male authors than there were of books written by female authors. That, friends, is a big number. A French-speaking Canadian female author has half the chance of being reviewed as a French-speaking Canadian male author and less than a non-Canadian male author. Male authors publishing in French get 2.3 times more review space than female authors publishing in French receive. French-speaking Canadian male authors receive six times the review space of non-Canadian female authors. Non-Canadian male authors writing and publishing in French get three times the review space than non-Canadian female authors, and slightly more than Canadian female authors. And, as in the English language reviews counted, our French data shows that men are still more likely to review male authors than female authors. Why? It is crucial to underscore that the French language data is in keeping with the initial 2011 results of the English language data. In other words, our numbers show a systemic gender inequity across languages in Canada. What can we do to generatively address this unhealthy imbalance? It is time for a truly intersectional and coalitionary feminist response and call to action. The numbers are a place to begin. The numbers are a place to begin asking better questions about representational justice in Canadian literary culture, yes. But if we are truly to foster a sustainable and inclusive literary culture we must also think carefully and publicly about the less-visible stories the numbers begin to tell. The 2013 Count shows similar trends to the 2012 Count—women are less likely to receive attention in the form of review space, and male reviewers are far more likely to review books written by men than books written by women. Of the 5,613 reviews counted, 57% cover male-authored books, while 37% cover female-authored books. Of the female-authored reviews counted, 51% were reviews of books written by women. Of the male-authored reviews counted, only 25% were reviews of books written by women. The statistics show that while women tend to review men and women’s books equally, men review men’s books twice as often as they do women’s books. Why is this still the case? In an interview with Chelsea Novak, Literary Review of Canada editor Bronwyn Drainie noted that women reviewers were more likely to turn down requests to review than men. While being clear that this was her own observation based on ten years of experience (rather than something she had quantified with data), she observed that the reasons women turned down requests to review were different than the reasons cited by men. Namely, the responses Drainie hears are based on being overworked: “I’m just too busy”; “I’m overloaded”; “I can’t take on anything else.” Drainie speculates that she hears these kinds of responses from women because they are, in fact, doing a disproportionate amount of service labour, such as writing reviews. “Everyone wants women to be represented,” says Drainie, “and since there are fewer and fewer of them, more and more gets loaded on their shoulders than on the shoulders of all the men.” Drainie’s observations and speculations are compelling, and they point towards other hidden stories the numbers may tell: stories of workload, gender expectation, and gendered and racial diversity to name a few. For example, as Ivan E. Coyote suggested in an interview with Tina Northrup in 2014, the “W” in CWILA is a contested space in a multiplicity of ways yet to be adequately considered. Last year, we added the category of “genderqueer” to begin to account for writers and reviewers who do not identify with the gender binary. This year, in consultation with trans women, trans, non-binary, and genderqueer writers and reviewers, we have refined how we present our data. We rely on the self-identification of writers and reviewers as well as the triple checking of pronoun usage to quantify data on writers and reviewers who identify outside the gender binary. And yet, this is only the beginning of the story. CWILA cannot hope to adequately address these issues or cultivate coalitions between woman-centred politics and gender critical politics more generally without writers and reviewers who identify outside the gender binary being actively represented within the organization itself on the board and in editorial positions. This, then, points to more risky and more urgent stories the numbers begin to tell. What will it take to continue to evolve CWILA into the kind of organization in which trans women, non-binary persons, women of colour, Indigenous women, and other severely marginalized groups want to take part? What will it take to feel as though we are truly working with a common purpose? The story that emerges is this: while the Count will never be comprehensive, it is a crucial starting point for opening up public conversations about representational justice in Canadian literary culture. The Count may never adequately represent the diversity of genders, languages, and racial identities that make up this country’s literary culture. What it can do is get us talking and thinking about who is speaking and why. It can get us talking and thinking about who feels a part of that “us” and who does not. The Count can serve as a starting place for moving discussions about gender inequity and the micro- and macro-aggressions of living in a patriarchal culture into a wider public discourse. That discourse is risky, but it is a risk CWILA feels the responsibility to take.